“The agencies are not in a position to say what the advantages of the framework are,” regulators said on the teleconference. That regulatory message is consistent with an April 2018 Bank Insights article that referred to the ratio as “fool’s gold” because it would lock banks into a capital regime that may be unnecessarily high. Banks must realize that if they opt into the framework they will be forced to hold at least 9 percent leverage capital, which may be much more than is needed. And that could be a serious threat to shareholder value because a meaningful amount of capital would be unnecessarily encumbered. The Invictus Group recommends that banks use capital stress testing with the right analytics to quantify their own capital requirements. Banks that do this, while integrating stress testing into their overall strategic planning and risk management processes, have found overwhelming success, both from a regulatory and strategic standpoint. A Deloitte global risk management survey, released in January, noted that regulators “have come to rely increasingly on stress tests to determine if a financial institution has sufficient capital.” The survey found that 71 percent of smaller institutions, or those with less than $10 billion in assets, were relying on capital stress tests to guide their banks. Overall, 87 percent of financial institutions reported using capital stress tests for strategy and business planning. The agencies estimate that 83 percent of community banks with less than $10 billion in assets would qualify to use the framework, as well as about 150 bank holding companies with assets between $3 billion and $10 billion. 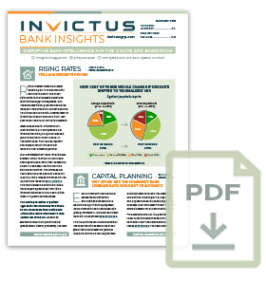 But a BankGenome analysis, the Invictus Group intelligence system, found that 92 percent of community banks could safely operate with an 8 percent leverage ratio, even in a severe downturn. Those banks would benefit most from using stress testing to prove their case. The proposed rule lays out some specifics for what the new capital framework would look like, but expect those to change before the proposal is final. The proposal was mandated under the Economic Growth, Regulatory Relief, and Consumer Protection Act, the Republican-led bill that amends Dodd-Frank. It would replace the Basel III guidelines for all banks that decide to use it. Lawmakers had called for a leverage ratio of anywhere between 8 and 10 percent. Industry groups had lobbied for an 8 percent ratio, but regulators decided more was needed to ensure safety and soundness. The proposal notes that the framework “should be calibrated not to reduce the amount of capital currently held” by qualifying banks. Until the actual rule is written, it will be hard to predict the impact of the proposal on acquisitions and other strategic initiatives. “My general viewpoint is having to comply with fewer capital guidelines is a better thing,” Weinstock said. The proposal is vague on many details, including how the new framework would be used to calculate bank assessments, currently based on Tier 1 capital. 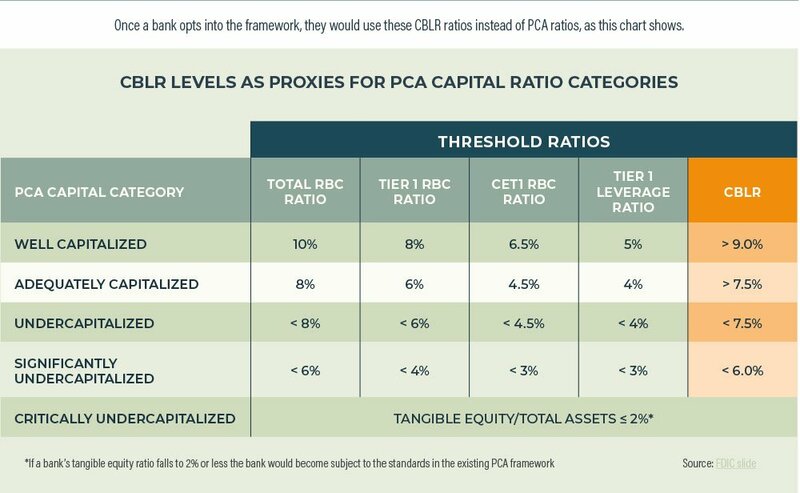 The proposal notes that if the CBLR framework were to be used, more than 90 percent of banks would have the same or lower assessments. One drawback for some banks is that the proposal would no longer treat trust-preferred securities as Tier 1 capital instruments, noted Bryan Cave Leighton Paisner law partner Robert Klingler in a recent analysis. He concluded that qualifying BHCs between $3 billion and $10 billion would likely not want to opt into the new framework with that restriction. Under the proposal, CBLR tangible equity would be defined as total bank equity capital or total holding company equity capital prior to including minority interests, and excluding accumulated other comprehensive income (AOCI), DTAs arising from net operating loss and tax credit carryforwards, goodwill, and other intangible assets (other than MSAs). Average total consolidated assets would be calculated similar to the current tier 1 leverage ratio denominator in that amounts deducted from the CBLR numerator would also be excluded from the CBLR denominator. Qualifying banks would be able to opt into the framework at “any time.” But getting out won’t be that simple. The agencies said they anticipate switching out would be “rare and typically driven by significant changes in the banking organization’s business activities.” Banks that want to opt out once they are in the framework would have to “provide a rationale” to regulators. Banks would also have to demonstrate to regulators that they have enough regulatory capital to meet the existing rules at the time of opting out.